Figure 4.33. 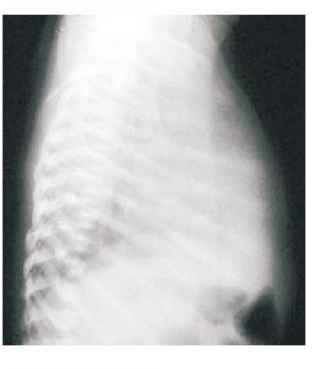 This infant did not have die typical clinical appearance of an infant with trisomy 18, but die radiographic findings of gracile ribs and antimongoloid pelvis were diagnostic. The diagnosis was confirmed by karyotype. Note the central Polydactyly of die left foot and syndactyly of the right foot. Central Polydactyly is an uncommon finding in normal infants and should alert one to the possible diagnosis of a chromosomal disorder. Figure 4.35. The chest radiograph of the same infant shows the gracile appearance of the ribs and the long slender clavicles, giving rise to the so-called "bicycle handle" clavicles. This radiologic appearance should always alert one to the possible diagnosis of trisomy 18. Figure 4.34. This full-body radiograph illustrates the typical findings in trisomy 18. Note the gracile (fine, delicate) ribs and the antimongoloid (very vertical) appearance of the pelvis. The infant also had cardiac enlargement which was associated with congenital heart disease (patent ductus arteriosus). Figure 4.36. The sternum is short in trisomy 18, and sternal ossification centers are absent or decreased in number. 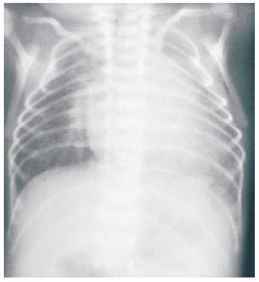 In this lateral radiograph of the chest in another infant with trisomy 18, there are no sternal ossification centers. Figure 4.37. Radiograph of die pelvis in die same infant as shown in Figure 4-36 with trisomy 18 demonstrates the antimongoloid configuration. The pelvis is small, the iliac crest is narrow, and there are large acetabular angles. Figure 4.38. 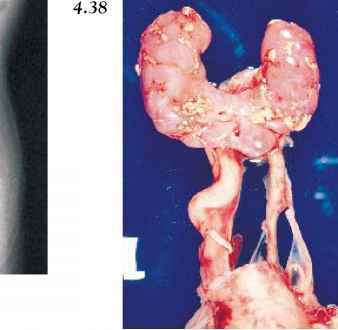 A pathologic specimen of a horseshoe kidney from an infant with tri-somy 18. Note the hydroureter and hydronephrosis on the left. Horseshoe kidneys, ectopic kidneys, double ureters, and other renal anomalies are common in tri-somy 18. Figure 4.39. 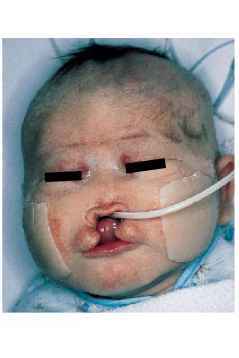 This infant with a median cleft, hypotelorism, and holoprosencephaly had an 18p- chromosomal defect. The most consistent features of the 18p- defect are ptosis, epicanthal folds, hypotelorism, rounded facies, and large protruding ears. In some cases, holoprosencephaly may be present. The hands and feet are relatively small. If the infant survives, there is severe mental retardation. Figure 4.40. The typical appearance of an infant with trisomy 21 (Down syndrome). 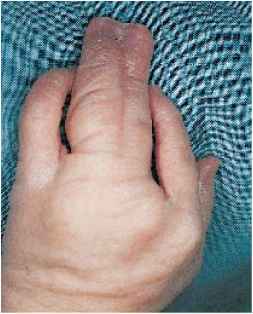 Note die marked hypotonia, flat facies, single palmar crease and separation of the first and second toes. The abdominal surgery was for the common finding of duodenal atresia. There is a burn at the left knee which occurred during surgery. The incidence of trisomy 21 is 1 in 700 newborns. The typical findings in trisomy 21 include hypotonia, poor Moro's reflex, hyperflexibility of joints, excess skin at the back of the neck, a flat facial profile, slanted palpebral fissures, dysplasia of the pelvis, and hand and feet abnormalities. Figure 4.41. The typical flat facies ("glatte-gesicht") in an infant with trisomy 21 is due to a lack of the orbital ridges, a flat nose, and microg-nathia, which together result in a lack of profile. Also note that there is some excess skin at the nape of the neck. Figure 4.42. In trisomy 21 the head is small and round (brachy-cephaly) which occurs as a result of the flat occiput and the flat facies (compare with the prominent occiput seen in trisomy 18 [Figure 4.25]). There is a mongoloid appearance to the eyes due to the slanting palpebral fissures, the ears are low set, the nose is flat, and there is micrognathia. Figure 4.43. 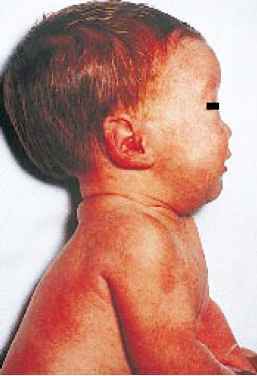 Trisomy 21 in another infant showing the typical flat facial features, flat occiput, and webbing of the neck. There was also mild microcephaly. Figure 4.44. 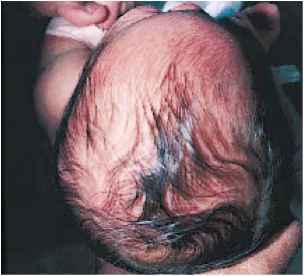 A view of the same infant's head shows the brachycephaly which results from the flat forehead and flat occiput. The sutures were normal. Figure 4.45. A close-up of the face of an infant with trisomy 21 shows the characteristic mongolian slant of the eyes, the hypertelorism, and the flat nose. Epicanthal folds, a common finding in Down syndrome, may be less obvious in the neonate than later in life. Epicanthal folds, which represent a vertical fold of skin on either side of the nose sometimes covering the inner canthus, are seen as a facial characteristic in normal infants as well as in syndromes such as Down syndrome. In infants with Down syndrome the tongue may protrude, giving rise to the impression that macroglos-sia is present. In Down syndrome there is a short palate and, hence, this is a relative macroglossia. Figure 4.46. Webbing of the neck is a common finding in Down syndrome. 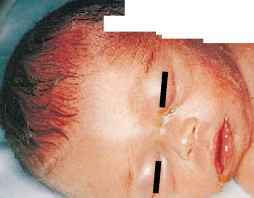 This male infant with marked webbing of the neck and flat facies had the typical karyotype of trisomy 21. Because of the webbing, the neck may appear to be short. 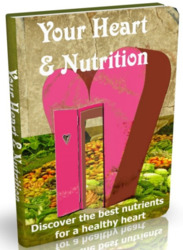 Figure 4.47. Posterior view of the same infant with trisomy 21 shows the marked webbing of the neck. 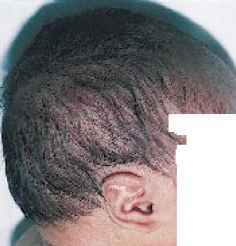 Note that the hairline is high in contrast to Turner's syndrome where the hairline is low and the hair may be in whorls. Figure 4.48. 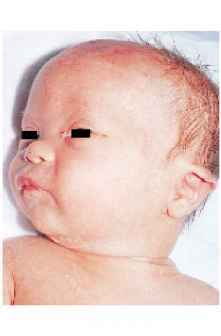 Down syndrome in a premature infant (gestational age of 33 weeks) with the typical karyo-type of trisomy 21. The clinical diagnosis of Down syndrome may be difficult in small premature infants because the typical findings such as epicanthal folds, etc., are not as obvious as they are in the term infant. Figure 4.49. Marked hypotonia in an infant with Down syndrome. Hypotonia is present in over 80% of infants with Down syndrome. Also note the separation of the first and second toes. What are the characteristics of turner syndrome? Is a flat occiput a sign of trisomy?